This piece was written during Obama’s first presidential campaign in response to the all the manufactured media hysteria about Obama’s Chicago connections to William Ayers and 60s radicals. The NY Times didn’t want it for an Op-Ed. Go figure. June 8, 1972, 9-year-old Kim Phuc, after an aerial napalm attack. 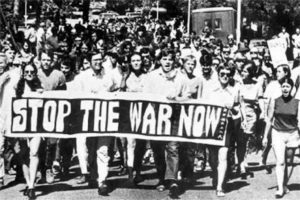 While John McCain and his colleagues were bombing Vietnamese villages from the air, defoliating an agricultural country with Agent Orange, and napalming civilians and soldiers alike, the Weathermen (and millions of others, young and old) were protesting a illegal, shameful, immoral, patently racist, vastly unpopular and ultimately unsuccessful war. A disclosure: I was one of those millions. So was John Kerry; so were Dr. Spock, Eugene McCarthy, Martin Luther King and, ultimately, Robert Kennedy. Another disclosure: I thought Weather was cool. Still do. I was proud of the fact that a few young white middle class Americans, like myself, were so outraged by the brutalities of the Vietnam War that they vowed to “bring the war home.” I might not have shared their guts or their passion, but like them I saw nothing morally unjustified in bombing a country that was unleashing more bombs on a tiny Asian country than were dropped in all of World War Two. Especially since they tried their best to injure no one (and mostly succeeded).